Some folks, often but not exclusively the young ones, complain about “scratchy” hats and other articles made of wool. 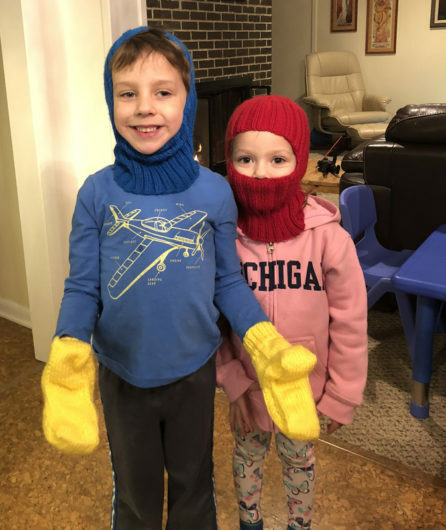 I knit these balaclavas in Berroco Vintage and the grandkids are all smiles. (You can tell by Evelyn’s eyes that she’s smiling.) No scratchiness. 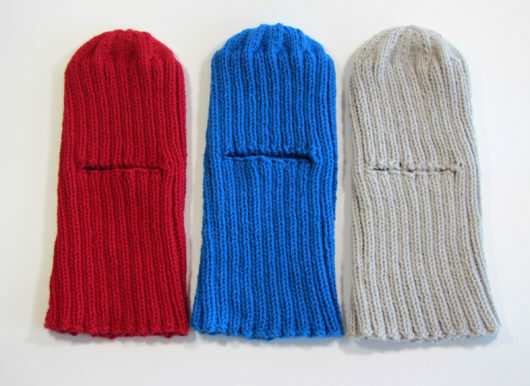 It’s possible some of the smiles are because the children decided these balaclavas are actually Lego helmets. 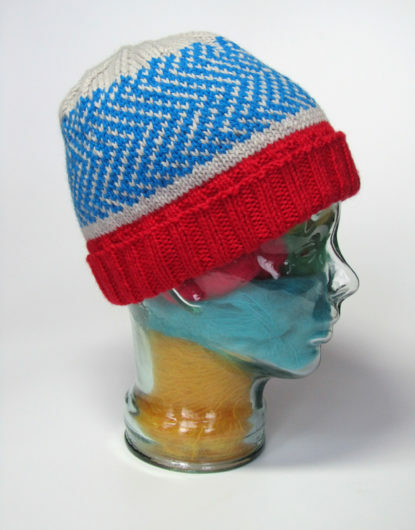 Vintage is an excellent workhorse acrylic (52%), wool (40%), nylon (10%) worsted weight blend. The wool adds warmth and wicking qualities. And the acrylic and nylon tame the perceived scratchiness. This is a Carol A. Anderson pattern from pages 6-7 of Cottage Creations booklet R18, “More Projects for the Community and Family.” It’s a super easy ribbed facemask that stretches to fit all the sizes heads come in. These are the youth size. Seventy grams of Vintage gets the job done. And when your granddaughter is no longer wearing her balaclava, she can put it to all sorts of other uses. Like swaddling a wolf stuffed buddy. 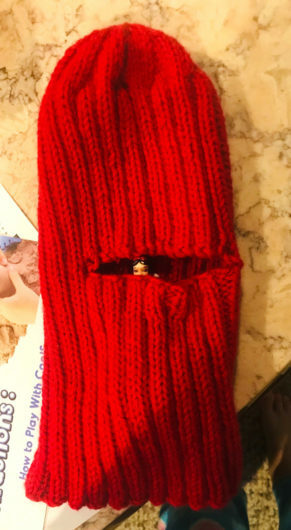 Or as a peekaboo spot for her Snow White action figure. Kids definitely know how to have fun with hats. With the extra Vintage I knit a less-than-beautiful, but totally non-scratchy Wherever It Points. 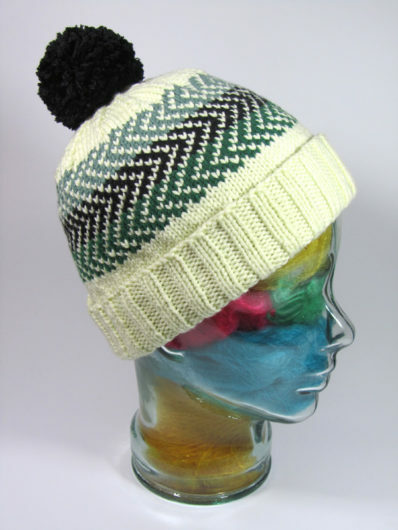 This hat is a freebie from Darn Knit Anyway. Please don’t hold my gaudy rendering of this fine pattern against it. 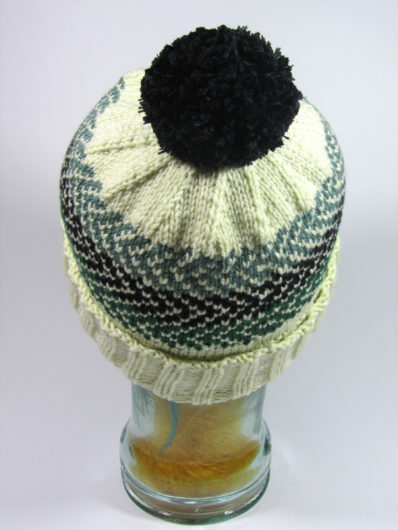 Some of the projects on Ravelry are stunning. In fact, here’s another I made, this time using Berroco Comfort. Comfort is a 50% acrylic 50% nylon worsted. So no pitiful little voices will accuse that their hat is scratchy. Now that is a fine hat. With an excellent non-pointy crown. This entry was posted in Knitting and tagged Berroco Vintage, Carol A. Anderson, Cottage Creations, Darn Knit Anyway, Wherever it points by Noreen. Bookmark the permalink. 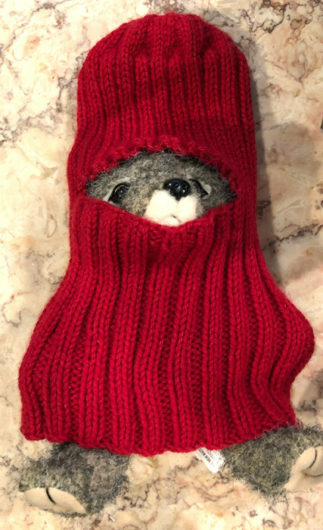 @Marty…I laughed myself silly when my daughter-in-law sent me a photo of the stuffed wolf stuffed into the balaclava. It followed Steve seeing that Evelyn was tucking Snow White in it during our visit.